FILE - The lobby of the CIA Headquarters Building in McLean, Virginia, Aug. 14, 2008. Newly declassified internal CIA documents show that some agency officials were convinced its detention and interrogation program provided "unique and invaluable intelligence," while others expressed deep reservations and cautioned against leaving a trail of documents questioning its legality. The CIA released the group of 50 documents, totaling hundreds of pages, on Tuesday in response to a request under the Freedom of Information Act. Many of the files are heavily redacted with full pages and identifying information such as sender, recipients and dates blocked out. President George W. Bush authorized the program six days after the September 11, 2001 terror attacks in order to capture and question al-Qaida militants and extract information that could prevent another attack. A February 2004 memo from CIA Deputy Director for Operations James Pavitt said information received from enhanced interrogations almost certainly saved the lives of countless Americans in the U.S. and abroad. "The evidence points clearly to the fact that without the use of such techniques, we and our allies would [have] suffered major terrorist attacks involving hundreds, if not thousands, of casualties." He highlighted information obtained from several key detainees, including 9/11 attack mastermind Khalid Sheikh Mohammed, who he said refused to cooperate before enhanced interrogation. Mohammed was waterboarded 183 times, one of three people to undergo the harshest interrogation allowed. 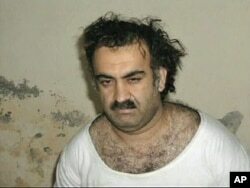 FILE - A photo of alleged Sep 11, 2001 mastermind Khalid Sheikh Mohammed soon after he was arrested. Another was Abu Zubaydah, who was waterboarded 83 times. The memo said Zubaydah was "arrogant and uncooperative" before his enhanced interrogation, but then became cooperative in helping interpret sensitive al-Qaida communications and identify newly captured operatives. But Zubaydah is an example of contradiction within the documents, which include Department of Justice authorization of his waterboarding and a CIA note specifying that if he dies his body will be cremated and that because of "planned psychological pressure techniques" he should remain in isolation for the rest of his life. A CIA associate general counsel memo dated a month before Zubaydah's waterboarding says interrogators concluded more aggressive methods were needed to persuade him to give life-saving information. It also argues for a formal declaration, saying people will not be prosecuted if they use an interrogation method that would otherwise go against U.S. laws banning torture. One of the undated documents says Zubaydah's cooperation had little correlation with the waterboarding. "In any event, there was no evidence the waterboard produced time-perishable information, which otherwise would have been unobtainable." A 2014 U.S. Senate report on the program reached a similar conclusion, saying the enhanced interrogation techniques were not an effective way to gather intelligence or gain cooperation from detainees. A newly released 2004 report from the CIA Office of Inspector General said perhaps the most significant information interrogations did obtain from detainees involved al-Qaida's planned use of weapons of mass destruction within the United States and led to the capture of the head of the group's anthrax program. More recently, the CIA said it is not possible to know whether the information gained from enhanced interrogation methods could have been obtained in other ways. As early as 2002 some within the agency were concerned about the legality of the program. A memo from that year strongly urges people to refrain from speculating in emails or agency cables about whether the activities were legal. "Such language is not helpful," it says. FILE - Protesters simulate the use of waterboarding on a volunteer at an anti-torture rally in front of the Justice Department in Washington, Nov. 5, 2007. A 2003 email from a staffer whose name is redacted goes further, saying they will no longer be associated with the program because of "serious reservations." "This is a train wreck waiting to happen and I intend to get the hell off the train before it happens." Two U.S. Air Force psychologists who helped design the program are currently facing a federal lawsuit from three suspected terrorists who were detained, but never charged with crimes. The American Civil Liberties Union filed the suit on behalf of the detainees and called the program "unlawful and its methods barbaric."